The safest and the best way to clean marble, granite & other natural stone in ALL areas of your home is with this TEAM of specialty products! Try them all - save a little money - find your favorites. One Quart of Floor Cleaner. One Quart of Daily Spray Cleaner for Tops & Vanities. One Quart of Soap Film Remover. One Quart of Mold & Mildew Remover. Whether it's simple daily cleaning, persistent mold & mildew stains or a safe solution to eradicate dingy soap film... this hard working team of products has got you covered! 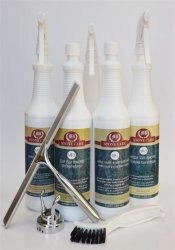 The safest and the best way to clean marble, granite & other natural stone in ALL areas of your home. 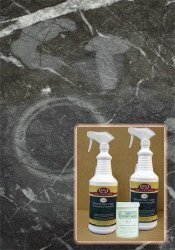 These products work great for your granite care AND they're safe to use on ALL Natural Stones including your marble! Cleaning granite counter tops & vanities is quick and easy with this cleaner! AND, it's safe to use on ALL Natural Stones and surfaces. This spray cleaner is a must for the daily cleaning care of stones that have been sealed with a penetrating impregnator sealer. Specially designed for polished or honed stone floors. Its pH balanced NO RINSE formula cleans soil and grime and dries with NO STREAKS! This highly concentrated detergent maintains a natural streak free look on your stone floor AND leaves behind no dulling film. Any surface not harmed by water. Hard water mineral deposits and unsightly soap film is easily removed with this specialized formula. Comes in concentrated form so a little bit goes a long ways! If you have mildew, this stain removal product will work wonders for you. It's not only the safest and best way to clean marble and granite, it's also safe on most delicate polished stone surfaces! Just spray it on and watch the mildew disappear. 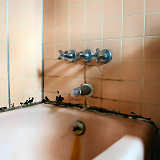 Anywhere Mold & Mildew Is A Problem! The classic shower squeegee: This 10 inch beauty is built to last! Dual wiping blades for superior performance. This one gets every last drop plus it's super soft so it won't harm your stone. Add in the long handled grout brush: Power clean your grout with ease. This tool makes getting in those hard to reach crevices a SNAP, plus, it won't scratch your stone. The starter kit is the very best product line available to the end user of Stone for the daily cleaning of stone tops & floors as well as specialty cleaning. Made for stone but versatile enough to use ANYWHERE in your home. I know how delicate Marble is and your product has got most of the stains off. I will certainly spread the word! 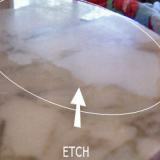 Thank you for mildew remover - it is a great product and the best way to clean marble... worked just like you said. Mildew is now gone! Thank you for fantastic service! The speed with which I received my products literally made my head spin. I am impressed with service as well as the granite care items I ordered. I will definitely order again and will recommend your company to all my friends and co-workers. Dear Carolyn, Thank you so much. You have gone beyond expectations and I truly appreciate it.